The Bavarian Cluster-Offensive is an initiative of the Bavarian State Government aiming at the development and strengthening of nationwide networks of enterprises, universities, research institutes, service providers and sponsors in 19 key sectors and fields of technology. The initiative should continuously strengthen the competitiveness of Bavaria and further consolidate the locational advantage. The Cluster-Offensive has a substantial influence on the Bavarian economy: By now around 6000 enterprises, among which a large majority are medium-sized companies, participate in the Cluster activities regularly. Additionally, individual cluster teams have organized more than 1500 events since the start of the initiative. The Cluster teams make a sustainable contribution to enhance the competitiveness of the companies involved in the Cluster networks. The Clusters contribute to strengthening the knowledge base of businesses, accelerating the implementation of new technologies, and facilitating the development of new markets. Two thirds of the surveyed companies reported that they profited from cooperation with other companies with the help of the Clusters. The Cluster-Offensive reaches the medium-sized companies in Bavaria with an SME-quota of 62 percent – also in the chemical industry. The Cluster-promotion is also financially paying off for the state of Bavaria. Up to now, the Clusters have raised around 70 million euros of federal and EU funding for the member companies – more than 11 million euros of which can be attributed to the efforts of the Chemie-Cluster Bayern within the last 24 months. The experiences and success after three years of the Bavarian Cluster policy were presented at the Bavarian State Government congress “Cluster-Offensive Bayern -Stark im Wettbewerb (Cluster-Offnsive Bavarian – Highly Competitive)” on 22 July 2009 in CCN Ost of the Exhibition Center Nuremberg. The congress with more than 1700 participants also provided the 19 Clusters with the opportunity of presenting themselves to the public at the associated exhibition. The Chemie-Cluster Bayern were particularly glad to have been able to have the two Ministers of State, Zeil and Heubisch, at the stand. 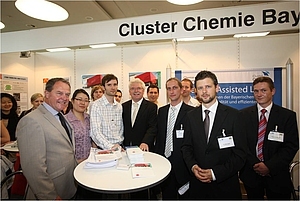 The Chemie-Cluster Bayern was established as a widely accepted and successful contact and cooperation broker in the first few years. From 2007 to 2009, without any former action groups to fall back on, a network platform was created for 160 members, including large and small enterprises and universities from all fields of chemistry. The successful establishment of the Cluster during these years was a manifestation of a joint motivation of the Bavarian chemical associations (bayerischen Chemieverbände), the Bavarian universities, and the state government with the aim of building chemical value-added on additional synergies though contact mediation and professional exchange. During this phase, the Clustermanagement laid the emphasis on the development of a unique database with which a suitable Bavarian project partner can be found for nearly every request. From 2010 to 2012 the Cluster became increasingly engaged in management tasks in joint projects due to the great potential for cooperation it developed and the competence. The Cluster took over the works of a project developer as support for funding applications, project controlling, and marketing of the results of the projects was requested by its members. The scope of subjects was not limited and the collection of membership dues was waived strategically in order not to slow down the momentum of an “operating network of competence.” The number of members grew steadily during this phase: Almost all new members joined the Cluster-network on their own initiative (usually on the recommendation of other companies). Despite the lack of association structure or other formalism, there were over 70% of the companies working with the Cluster-management in specific projects as “active members” by the end of 2012. During this time, the Cluster-management has expanded from 2 to 6 people, developed into an international network with global presence and projects, and established a service portfolio as “full-service-innovation-management”: The Cluster-management supervised 37 joint projects of over 40 million euros and organized public fundraising (from the federal government and EU) of over 11 million euros in these three years. To better market chemical R&D-results, an innovation dialogue with important customers and downstream industries were started with the campaigns “Chemistry meets…” and the “Transatlantic Technology Transfer Initiative.” The developers of consumer products or automobile manufacturers could submit “Challenge Statements” regarding chemistry to the Cluster. A reginal innovation network in the “Bavarian forest (Bayerischen Wald)” was realized with the network glass (Netzwerk Glas) and a purchasing alliance for electricity and gas was founded for the members, which reduced up to 30% of the costs. At this stage, the Cluster-management has proven itself as an efficiency driver of chemical research and development by significantly accelerating the cost-effective development of new products and their entry to international markets. Since 2013 the Chemie-Cluster Bayern has been transitioning from the driver of synergy to a market opener. At the beginning of 2013, the results of the Cluster can be recognized as an “institutional experiment” to achieve the greatest possible market capitalization at this stage (2013 – 2017) from the resources we have built up. The achievement of the Cluster’s objectives can be measured with the added value for the members. Potential markets worldwide for existing products, technologies, and services shall be found with the “Value Creation Partnership Chemistry (Wertschöpfungspakt Chemie).“ The Chemie-Cluster takes over marketing and sales tasks of the members to a certain extent while remains focused on innovations. The Chemie-Cluster Bayern obtained the Gold-Label of the European Cluster Excellence Initiative (ECEI) already in 2013. The Gold Label is a certification which was only awarded to a few cluster organizations in Europe after a multi-day assessment of independent reviewers based on defined criteria. Due to new funding laws and policies at the EU level, membership fees had to be introduced in 2016. Thus, the performance based on the operating structures so far (particularly the public funded ones) can be further developed. As a non-profit-oriented organization, the Cluster will continue to see the interests of its members as the core element and tap into the existing potentials with this spirit in mind. At the same time, new strategies and concepts regarding the financing of the Cluster will also be worked out and implemented to ensure a sustainable strategic mode of operation of the Cluster.